When it comes to Windows (and Windows programs...) it's never late to "learn" something. Or forget something? Straight to the point: as I needed a terminal to connect to my Solaris box down there, I decided to go for PuTTY. In this laptop I'm running Windows Vista (I'm not joking...) and I didn't want to install Cygwin for such a basic task. PuTTY doesn't even intall: you just download it and run it. Fine! As soon as I connect, the first surprise. Just a remark for the PuTTY guys: Windows/Translation doesn't seem such a good option name, to me, for a character encoding. Thank you, very useful tip. Thank you. Easy and right! In order to make these changes permanent in Putty, you open up Putty, make the changes you want to save, then click back on the Session window, click on the "Default Settings" under Saved Sessions, and then click on Save. 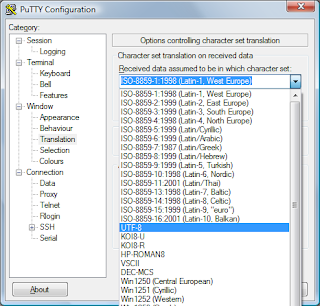 Next time you open Putty whatever you changed prior to clicking save will still be in effect. Thanks ! You've made my sad life a bit less sad ! Thank you my favorite solaris addict ! Nessie on Google Maps: does somebody see a boat? Has the apple got rotten?